Thank You for The Love - Xiaomi, India! 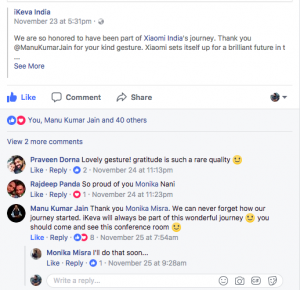 Thank You for The Love – Xiaomi, India! 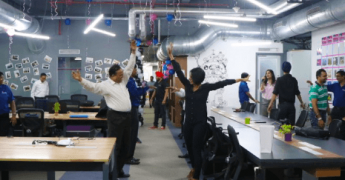 While the concept of co-working spaces is catching on, we at iKeva aim to help the startup community function in a more flexible, collaborative and productive way. Apart from providing an efficient working space, we offer an open, barrier-less office culture that helps to build a community of like-minded people. Our Coworking spaces are cost-effective and equipped with everything an office needs – meeting rooms, great Wi-Fi connectivity, cafeteria, a dedicated support team and the much-needed foosball tables. However, our services are not just about coworking spaces and benefits- it’s beyond that. For us, it is also a constant challenge to ensure that we deliver value to our customers. Be it providing member benefits that truly benefit our community, or helping the community connect with each other for services. We try being the enabler at every step! While we are working super hard to bridge the gap between our members and convenient workspaces, we wanted to draw light on how honoured we are to have been a part of Xiaomi -India’s journey. Xiaomi started its India operations out of iKeva Bangalore in late 2014 with just 20 people. They stayed on for about 6 months to launch their new office nearby. In that period, our relationship with Xiaomi grew leaps and bounds. So much so that, a part of iKeva still remains in the form of a conference room. We are grateful to Xiaomi for this kind gesture. We wish them all the best for a brilliant future in the Mobile market, while retaining just a little piece of iKeva in their office!